All the information that follows is from Rainer Foelix’s excellent book Biology of Spiders. Photos used with permission from Sean McCann. Here I will provide a brief orientation to the spiders that I hope will help place future posts that feature spiders in different suborders, orders and families. I will try to add more detailed taxonomy information as I go along. Also, I hope this post will help me to remember some basic information that I am always re-learning (never again will I look up orthognath vs. labidognath!). There are about 40,000 more than 44,000 identified species of spiders in 110 112 families* (I hope that someday I will have posts highlighting every family!). The most ‘primitive’ (phylogenetically oldest) spiders are in the suborder Mesothelae. They have segmented abdomens like other arthropods, and unlike the rest of the spiders. There is only one family in the Mesothelae, the Liphistiidae. I don’t really know anything else about them at this point (I will come back to them in the future). The rest of the spiders are in the Opisthothelae, which contains the two other suborders, the Mygalomorphae and the Araneomorphae. Both the Mesothelae and the mygalomorphs have orthognath chelicerae. Spider chelicerae are a large pair of mouthparts tipped with articulated fangs through which venom is injected into prey. Orthognath chelicerae work in parallel. Make ‘air quotes’ with your first two fingers – like that. The majority of species in the Mygalomorphae are tarantulas, in the family Theraphosidae (in French, a tarantula is called a ‘mygale’, which makes this easy to remember ever since I spent some time in French Guiana). 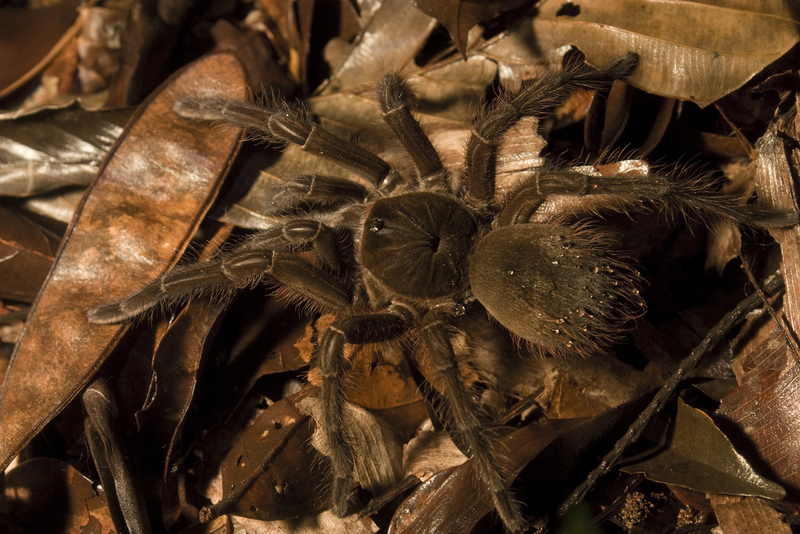 Female Theraphosa blondi (Theraphosidae) in French Guiana. There are several other less well-known families in the Mygalomorphae that I will get to in later posts. Mygalomorphs can produce silk, but most don’t build webs; they lack the pyrifrom silk glands that that araneomorphs use to cement their silk threads together or to a substrate. 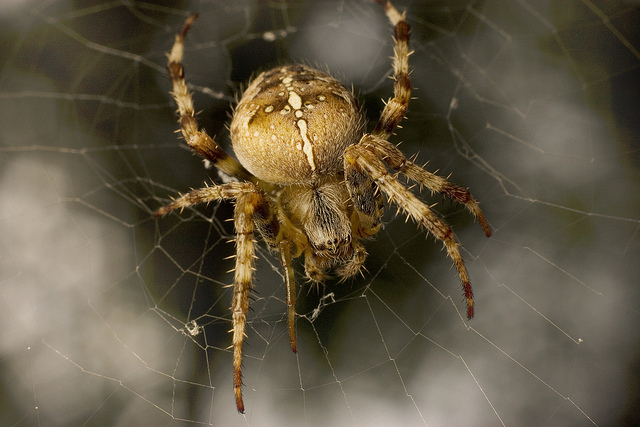 A common European Garden Spider, Araneus diadematus (Araneidae), on her orb-web. A gorgeous Salticid. Check out those brightly coloured labidognath chelicerae! The red bits are the opposing articulating fangs. 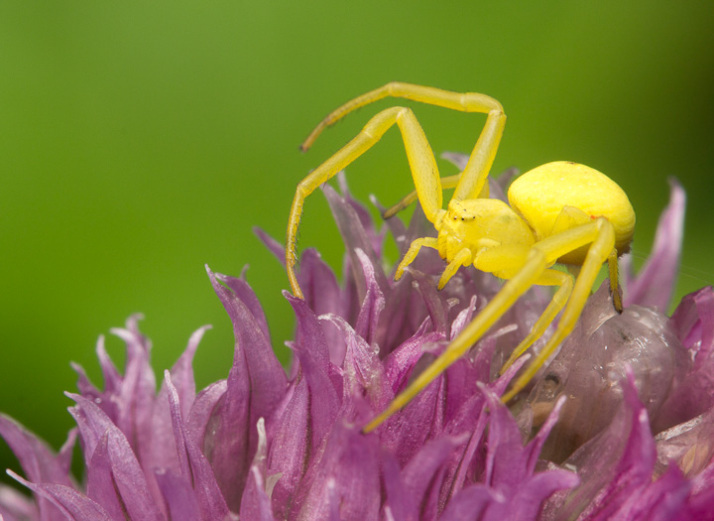 A goldenrod crab spider, Misumena vatia (Thomisidae) doing her thing. 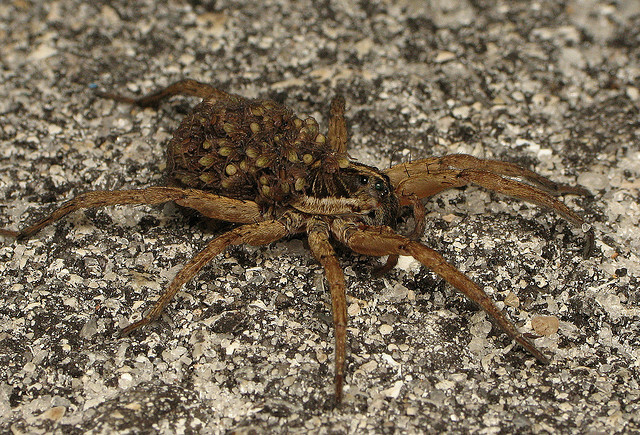 A female Lycosid carrying her spiderlings on her abdomen. Some spiders have highly developed brood care! A female cellar spider, Pholcus phalangiodes (Pholcidae) carrying her egg sac. 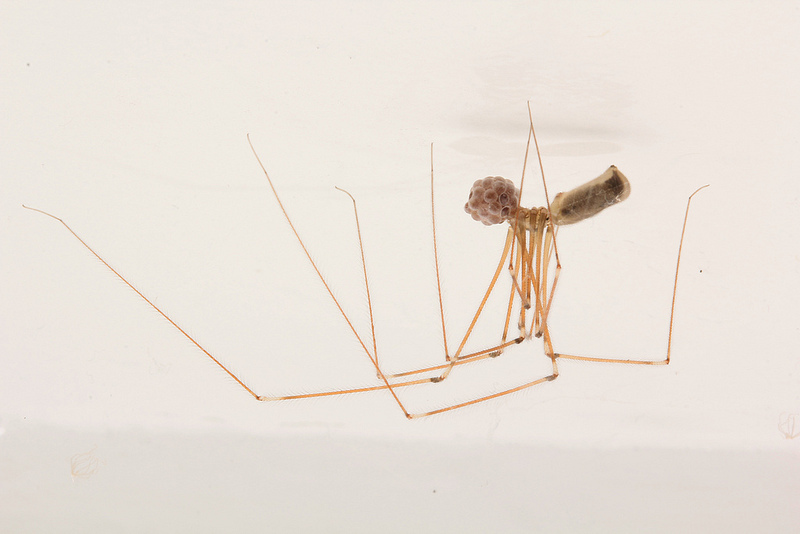 I grew up calling these spiders daddy long legs, but that name is also sometimes used to refer to harvestmen (order Opiliones), which are non-spider arachnids. 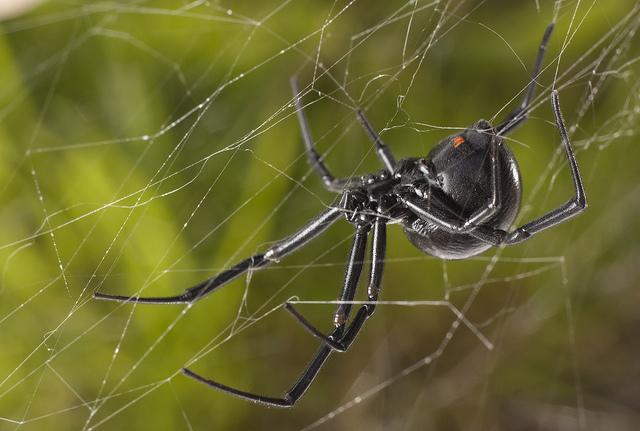 Female western black widow, Latrodectus hesperus (Theridiidae), on her tangle-web. 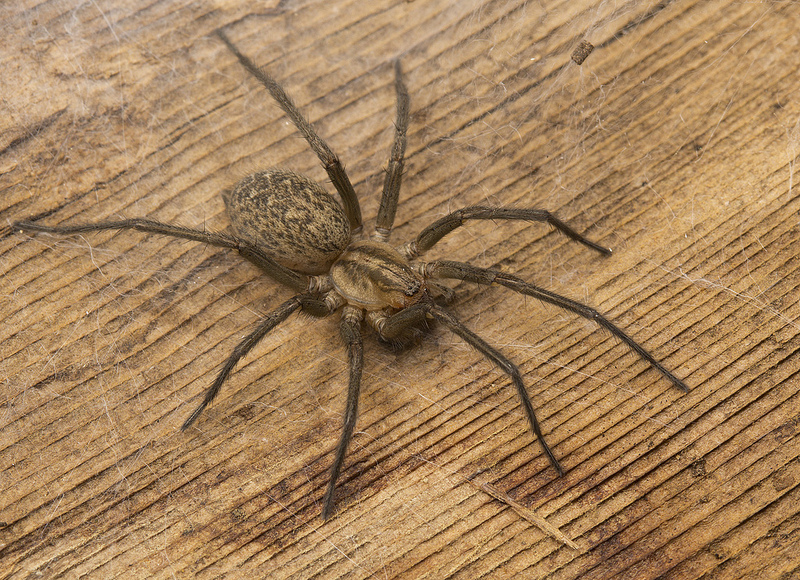 Female hobo spider, Tegenaria agrestis (Agelenidae). Her close relatives T. domestica and T. duellica are often found in homes. and lots of other less common/well-known ones that I intend to make posts about in due time. Although some of them don’t build webs at all, they all produce silk draglines that can be anchored to a substrate (often useful as a sort of ‘safety line’). For more about the phylogenetic relationships among the Araneae see the tree of life page. 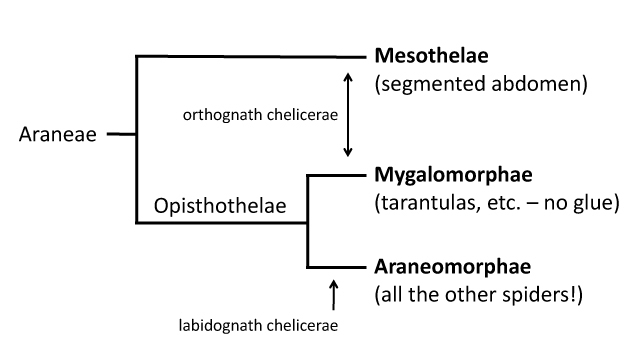 UPDATE: I learned this morning that the in the latest phylogenies Opisthothelae is considered a suborder, with Mygalomorphae and Araneomorphae as infraorders. *UPDATE 2: Thanks to Chris Buddle for pointing me to the latest information at the World Spider Catalog! 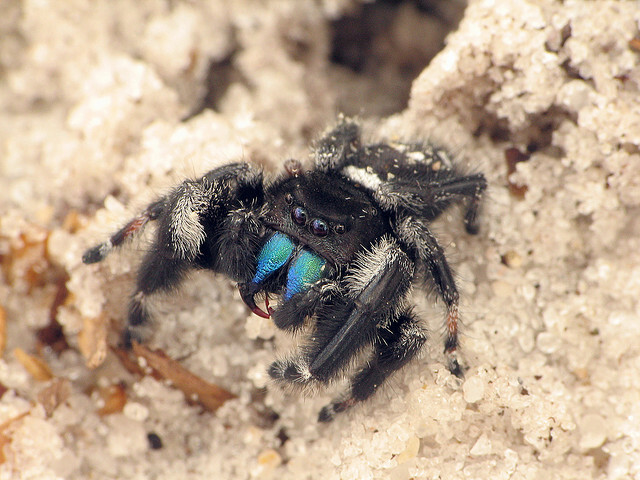 This entry was posted in spider diversity by cataranea. Bookmark the permalink. Thanks Chris! I have updated the information accordingly!